Amid the continuing power struggle within the AIADMK, BJP leader and Rajya Sabha member Subramanian Swamy on Monday wondered why Tamil Nadu Governor C. Vidyasagar Rao was not inviting party General Secretary V.K. Sasikala to form the next government. "Sasikala has given a list of 139 MLAs to the Governor all with their signatures. She has even offered to present them in person. 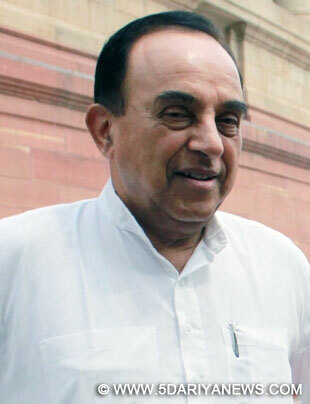 Whereas (acting Chief Minister) O. Panneerselvam has not even presented a single paper," Swamy told the media. "Sasikala has the majority. She has no disqualifications as given under Article 191 of the Constitution, so I can't understand what is the Governor waiting for," said Swamy clarifying that opinions were his personal.He said it appeared that Governor Rao was "under some sort of compulsion" to keep delaying. "The Governor has a list of candidates, there is no challenge on that list nor is there any fraud. It has been seven days, what is the Governor waiting for. It seems the Governor is under some sort of compulsion," added Swamy.